Why do I read? What was it that turned me into the voracious devourer of print that I am today? What was it that developed in me an overwhelming passion for literacy that has shaped my career and set my journey in life? Well, I think I can attribute that to two inspirational women and one truly fabulous book. The first inspirational woman was my Grandma. She read me endless stories. I was (and still am) a very fussy eater. Grandma was employed to read to me to distract me whilst my Mum attempted to spoon food down me. They never did succeed in making me a less fussy eater but Grandma did give me a hunger for stories. Thanks to her I was reading a little before I started school and was eager to learn. In school I had mastered the reading scheme before the end of Year 2 and was considered “a free reader” able to choose my own books from the library (how exciting that was!). I read my way through the school’s collection of folk tales from England, Ireland, Wales and then Europe. I encountered the second inspirational woman in when I was in Year 3. She was a four foot eleven pocket-rocket called Miss Moss. She was a true child of the sixties, with brightly coloured mini-skirts and bobbed blond hair. She was so exciting in amongst the plain straight-laced school mistresses that made up most of the staff. We loved her. She always read to us at the end of the school afternoon and had us utterly spellbound. Every afternoon we were left hanging, desperate to get back to school the next day for the next instalment. She knew how to create that need in us long before Eastenders. 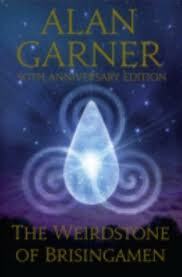 One day she brought in the book that I can honestly say is still my all time favourite and the book that led me to what I am today, “The Weirdstone of Brisingamen” by Alan Garner. The Weirdstone of Brisingamen is a fantastic adventure story. It unfolds the story of Colin and Susan, a brother and sister sent to st ay at the farmstead of craggy Gowther Mossock and his kindly wife, Beth. They are unwittingly plunged into a thrillingly dangerous adventure, in which goblins, witches and worse attempt to seize the gemstone that Susan wears around her wrist on a bracelet. It’s a tale that fired our blood and chilled our spines, as Colin and Susan are pursued by their fanatical, misshapen enemies, over dales and under the ground. What made it more frightening was that these other-worldly creatures had sympathisers and collaborators among the local inhabitants. It was also set in Alderly Edge , not far from where we lived! School now was only about this book. We went everyday to find out what had happened to Colin and Susan. Miss Moss read on and one Friday afternoon we were with the children being pursued by someone or something through a disused mine in Chapter 10 Plank Shaft. We were with them, anxious, as they were forced to cross over a rotting plank that spanned a deep chasm in almost pitch-black darkness, only to find that it was a dead end on the other side and that they would have to cross over it once again! Phew, Colin managed to get back across safely once more, but Susan slipped and as her torch fell from her hand it revealed hundreds of eyes staring up at her from the depths of the chasm, she screamed and began to fall! Miss Moss closed the book, “I am sorry children, I will not be reading any more of this story to you. It is far too frightening for you,” she told us. And she never did! I still do not know to this day whether she intended what of course happened that weekend, that nearly everyone in the class urged, pleaded and persuaded parents to buy the book because we had to know what happened next. It was a challenging read for a year 3 child but I spent my pocket money on it and still have it on my shelf in pride of place. If it was intentional – it was brilliant Miss Moss, thank you, it made me into a passionate reader of books. I have used the book several times in my teaching career. It has never failed to ignite in children the same excitement it awoke in me all those years ago. Unlike her though, I have never been brave enough to stop and leave them so hungry for the rest of the story. We have always lived it all the way through together, felt the excitement, felt the danger and cried the shared tears as we finished it and experienced the loss of a wonderful character we have all fallen in love with . It is now fifty years since it was first published and Alan Garner, w ho Phillip Pullman has described as, “better than Tolkien”, has just written “Boneland” which picks up the story decades later when Colin is an adult. I can’t wait for it to be released. I am that excited child all over again. So please, please, read to your children and do it well. You too might inspire them to have a passion for books and to carry one special treasured story in their hearts throughout their lives, just like Miss Moss did for me. And, if you haven’t read it, treat yourself to “The Weirdstone of Brisingamen” by Alan Garner, a classic fantasy adventure. I challenge you to shut the book at chapter 10 Plank Shaft and not read on…… bet you can’t. Janette’s favourite book has made it to the shortlist of the Coventry Inspiration Book Awards ‘Our Favourite Classic’ category. If it’s your favourite too, don’t forget to vote for it! This entry was posted in Books, Children's books, Reading, Writing and tagged Alan Garner, Coventry Inspiration Book Awards, Weirdstone of Brisingamen by coventryenglish. Bookmark the permalink. Unlike you I was never read to. Or was even allowed to read at home! I should’ve been called Matilda! Like you though I too encountered W of B at school. In top juniors. Mrs Danskin read it to us. And it was my favourite book and set me on the road of discovery of literature. I’m now a primary teacher reading WHOLE books to my class. Always have; always will. Thank you for sharing your experience. I am so glad you found The Weirdstone and shared the excitement. That is two teachers inspired by Alan Garner and passing on the passion for stories he created in us. I loved Alan Garner’s books as a child, along with C.S.Lewis I am looking for his books for my Kindle now. I was enthralled to think Alderley Edge was such a Magical Place. Alderley Edge is magical . I made Mum and Dad take me there repeatedly after I read Weirdstone I wanted to find the wizards gates and meet Fenodrey. I am glD you loved it too. Thank you for reminding me of a book I read many, many years ago. Immediately the feelings of trepidation and suspense I had felt then were re awakened, wonderful!!! I was always read to and am passionate about reading to any one who will listen. No longer a primary school teacher I have a captive audience in grand children – lucky me. I hope you share the Weirdstone with them . They will love it just like you did, it still captures hearts all these years on. Keep sharing the love of books. Reading about Miss Moss, I was reminded of Miss O’Carol who would read to us in the juniors – during assembly and in class. Although she didn’t read Weirdstone to us, she had a real passion for reading and always left us wanting more. She would encourage us to buy saver stamps for the school book club that my Mum ran – there was always a race to have enough stamps to buy books, written by the authors she popularised . I hope I can inspire the children in my classes, just as they inspired us. i know you do already Clare. Keep reading, it is through exposure to good quality text that we develop good writers. I have never read the Weirdstone but feel it is one I should try. I think it is clear that many of us gain our love of reading through somebody who has inspired us along the way. My inspiration was Mr Butcher, my head teacher, who took myself and a group of others each week for a reading club. I now realise this must have been a G & T group! We read classics such as Animal Farm and Lord of the Flies – two books which have stayed with me since the age of 11. If we as teachers can inspire our pupils as we have been, then we will be clearly doing something right!